Work to produce some of the world’s leading super cars in Coventry, England, started earlier this month. Dutch firm Spyker Cars N.V. (“Spyker” or the “Company”) has switched the assembly of its new Aileron super car from Zeewolde in Holland to a new plant at CPP (Manufacturing) Limited (“CPP”) where the first cars have gone into production. In order to meet new production targets, CPP will look to provide around 40 new jobs taking its workforce to approximately 150. The news follows Spyker announcement last November and is in line with the company’s strategy to scale up production and reduce, where possible, costs related to the manufacturing process. Spyker representatives Victor Muller and Vladimir Antonov, along with Brendan O’Toole, Managing Director of CPP, visited the Coventry plant where the assembly line is located. 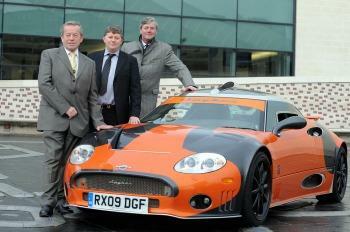 Spyker production capacity can reach five cars a week in one shift at the new plant. CPP has established a new bespoke 20,000 sq. ft. assembly plant close to its headquarters on Wheler Road in Coventry. Muller said the move was a “landmark in the history of Spyker” which was originally founded in 1875. CPP produced the first prototype cars for Spyker when Muller resurrected the brand in 2000 and works with a host of leading motor manufacturers.